We know about SBI Home Loan. But SBI has another loan type called Sbi max gain home loan. You will pay LESS interest amount when compared to another type of home loans. 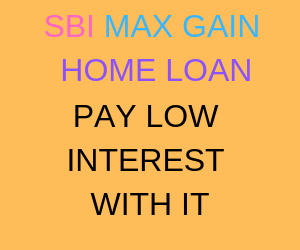 PAY LOW INTEREST WITH SBI MAX GAIN HOME LOAN. State Bank of India is offering a Financial Product called SBI MAX GAIN HOME LOAN. This scheme is a attached extra feature of SBI Home Loan. SBI Maxgain is a home loan saver scheme whereby a person can park their surplus money in loan account to get interest amount benefit. An applicant can invest an amount which is equal to the home loan amount and this amount will be tax-free. But if the amount invested exceeds the home loan amount, then that amount will be taxable in the hands of the person. What are the features of this SBI HOME LOAN(MAX GIN)?.. Basically, a SBI Maxgain account is an O.D(overdraft account). An OD account means borrowers have to pay interest for loan amount that they have utilized. Borrowers can deposit the funds into O.D account when they have surplus money. Again, they can withdraw money when there is a requirement for funds. The underlying collateral for this account would be the home that the individual has given up as collateral for the purpose of the home loan. This amount can be withdrawn at any time and can be used for a variety of purposes such as bill payments or other financial needs and emergencies. LOan Interest amount will be reduced to the extent of funds deposited. As the fund depited in the account. The rate of interest charged would be on the new principal amount which would have decreased as per the new balance in the loan account. So the new EMI would be less than the previous one. Through this process, an account holder would save a significant amount of money over the time. You can withdraw money any time depending on your needs. A Bank Fixed deposit is similar this Max Gain Loan Account. A lot of people invest their money in fixed deposits(fd’s) because they get reasonable returns on their investment with no real risk to the principal invested. In case of a fixed deposit, we have to lock their money in for a period of 5 years to get tax deduction benefits. Here, A better option, in this case, would be to invest the money in a Maxgain account of SBI. Moreover, The money invested can be withdrawn at any time and the rate of interest is usually also higher by around 1%-3%. Hence, This would make it a much better investment. The rate of interest applicable to a SBI Maxgain Loan account is a floating rate. Hence, the interest rate fluctuates based on market conditions and shifts based on RBI policies. Due to this effect, the EMI amount/tenure may change, depending on external factors. This makes it a little unpredictable as it is difficult to predict market behaviour with any sort of certainty. So, This rate of interest works in a more predictable manner when the economy is stable for extended periods of time. It would be advisable for people to start using this account for parking all their surplus wealth in this loan account. This will be beneficial in many ways. Your money deposited in this loan account will grow, and this can be used for your other requirements in future. The money also helps reduce the burden of the home loan repayment. It will decrease the principal amount on which the interest is charged and thus the overall interest amount would also decrease significantly. No Extra Charges: There is no extra charge for opening a Sbi Maxgain account. All that an applicant needs to do is to submit the necessary documents, and their account will be opened. But it must be remembered that this account can only be opened when someone has taken a home loan of at least for 20 lakh. Withdrawal can be done at Any Time: The amount deposited in a Maxgain account can be withdrawn at any point in time. The money can be withdrawn for several reasons that include alternative investment options and unexpected expenses. Lowers Interest on the Home Loan: The amount deposited in the Maxgain amount is deducted from the total loan amount taken. This reduces the amount of interest as the principal amount has now decreased. Thus, the account holder saves a lot of money in long run. Multi-Purpose Usage: The Maxgain account can be used for a variety of purposes using different instruments. It can be used to pay bills such as electricity, shopping, credit card payments etc. Both cheque book and net banking facilities are also available, just as with a regular savings or current account. Tax-Free Investment: The money deposited in the Maxgain account would be completely tax-free. But it must be noted that tax-deduction will apply only to the amount equivalent to the home loan taken. ATM Services are there with this loan account: An individual can also avail ATM services on this Maxgain account. This makes the withdrawal of money from the account much easier. Typical SBI MAX GAIN HOME LOAN ACCOUNT STATEMENT. Book Balance means loan already used for construction of the house. Available balance means any surplus amount you have deposited into this account or any pending amount to be sanctioned(credit linked payment) from the bank or interest earned on the amount you have deposited. Drawing power means it is not the total amount taken it is the total outstanding balance. Book balance is nothing but difference between drawing power and available balance. As drawing power is 35,00,100 and available balance is 1,00,000. Book balance is 34,00,100. This will be shown with negative sign. Most people, including SBI home loan account holders, do not have much awareness about Maxgain home loan. It takes a lot of explanation and clarification to get people to understand the benefits of this Sbi max gain scheme. The intricacies of the scheme can be quite difficult for the average person to understand. Therefore, few people may not understand as quickly as they might expect. Less Tax Benefits: The tax benefit would not hold if the investment is in excess of the home loan amount taken. Therefore, people should not think that all their money deposited in this account is completely tax-deductible. They have to redo their homework for other tax saving instruments. Read article about Own House – cost that you can afford? Click here to read. Also, read the article about Chit fund percentage. Click here to read. Also, read the article about Real Investment with loan is loss-Why?. Click here to read. Source of this Sbi max gain Loan is Paisabazaar.